John Constantine is an occult detective from Liverpool, England. An accomplished magician, he oddly enough, actively tries not to use magic against his adversaries. He will utilize spells only as a last resort. Rather than magic, John tends to rely on his cunning. He is a skilled con artist and negotiator. 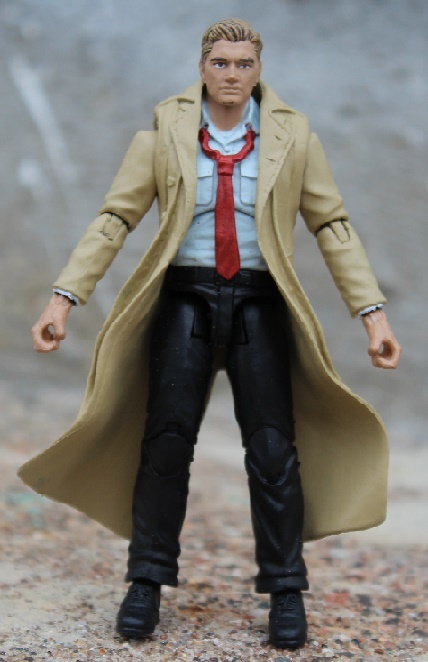 I'd been wanting to do a Constantine figure for a while and had one started using pure Joe parts, but when I saw Zombie Labs "Bane" figure, I knew I had the perfect base. The elbow joint broke right out of the package, so I replaced it with one from Cobra Commander. The trench coat comes from a X-Men Origins: Wolverine "Sabertooth" figure.